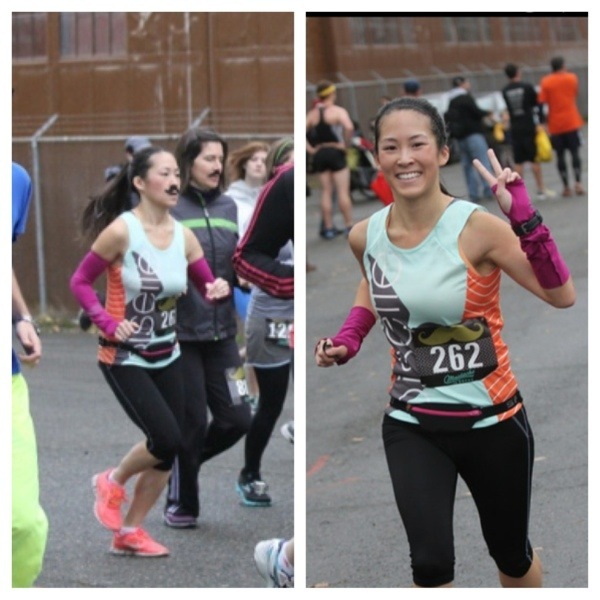 I have a fun race and weekend recap for you! 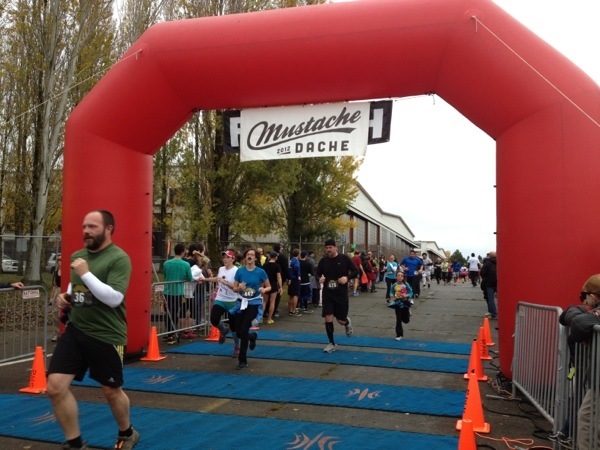 This past Saturday was the inaugural Mustache Dache 5K starting and finishing at Magnuson Park. 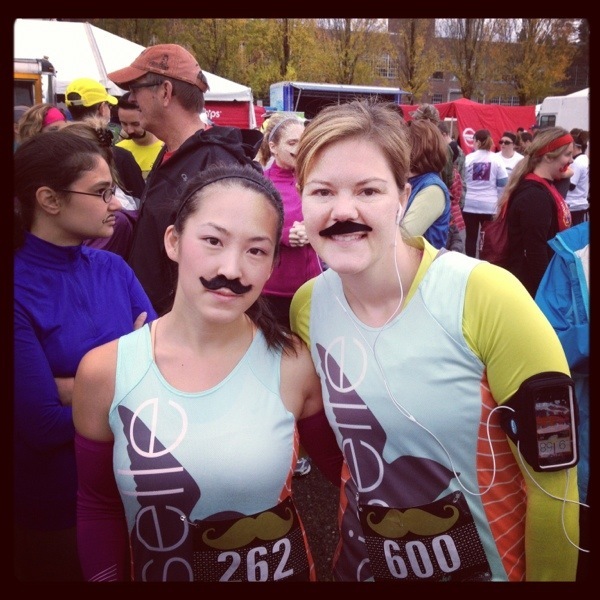 The race itself was held in support of Movember and men’s health. 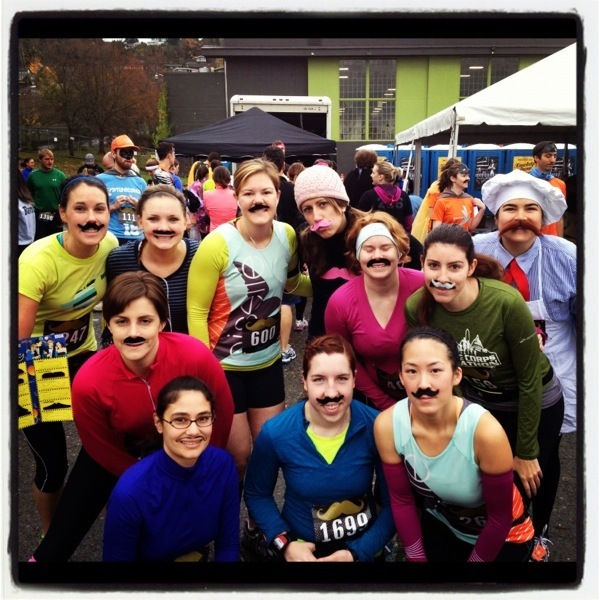 Have you seen masses of men sprouting mustaches or facial hair during the month of November? Well, most likely they are doing so for Movember to raise funds and/or awareness for men’s health, specifically prostate and testicular cancer. In addition to supporting Movember, a huge group of amazing blogger/runner ladies were running this, so I was super excited to see them. They’re such a fun group of women! 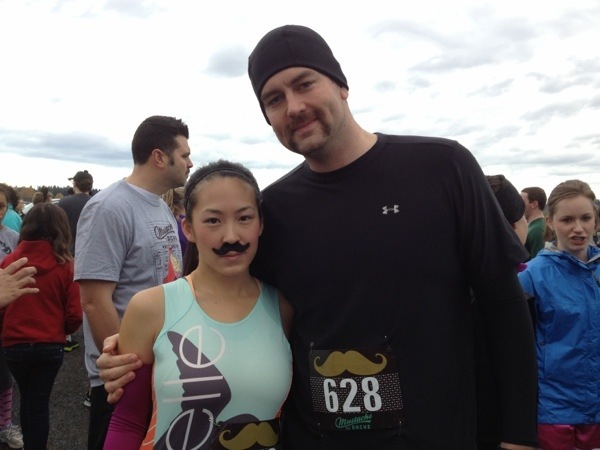 Everyone came prepared with their staches including my fiancé, Joe, who’s growing an actual mustache for Movember. I know, it looks amazing. The night prior, Joe and I went to Fleet Feet, a local running store, for the packet pickup. In addition to the sweet bib (more on that later), I had purchased one of the Mustache Dache t-shirts because they looked sweet and portion of proceeds went to Movember. 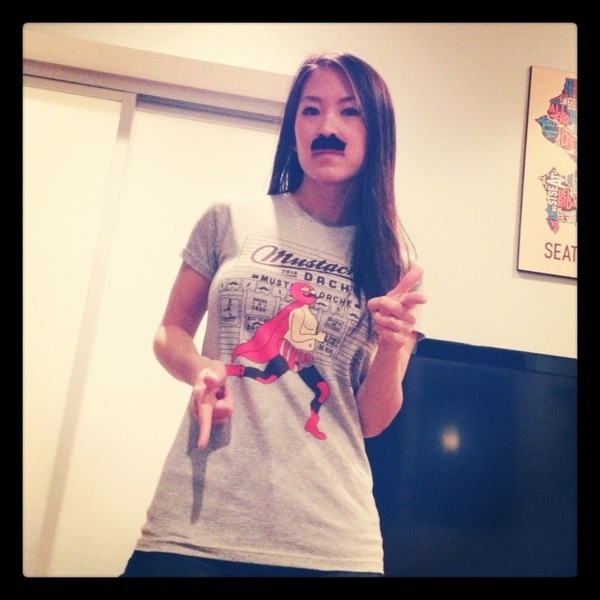 Of course, when I got home, I had to try out the mustache look with the tee. Even Lola loves rockin’ the stache. On Saturday morning, Joe and I woke up at the leisurely time of 8:15am and proceeded to get dressed and ready. This race marked a big moment for me as it was my first time sporting the Oiselle Team race singlet!! 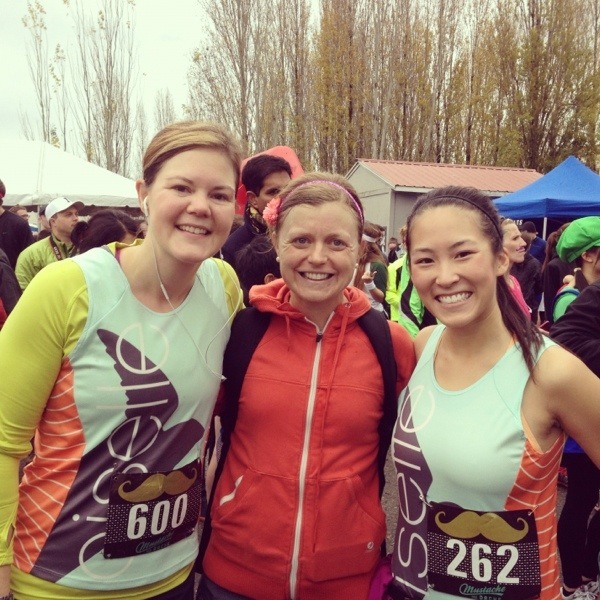 My first official race as a Oiselle bird included me rocking a hairy mustache on my face. Ha! Plus, the race bib was super awesome. 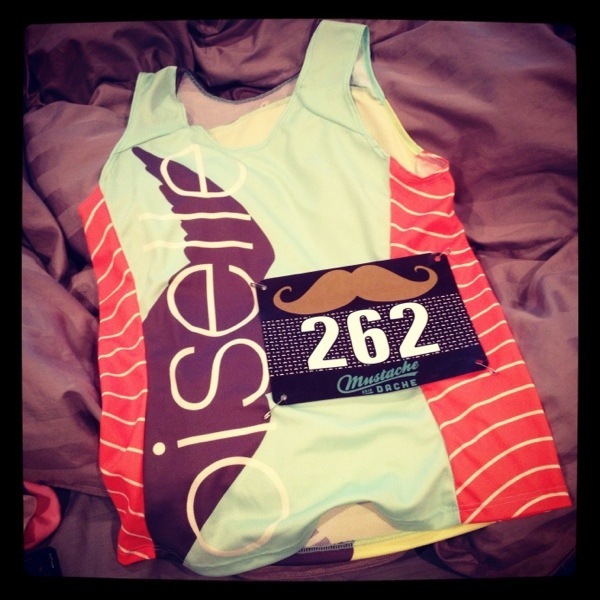 Not only did it have just a mustache on it, my bib number was the magic number 262. Did that somehow know that in 2012 I completed my first and second full marathons? They must’ve known, or it was fate. 🙂 Likely the latter. The race start time was the latest I’ve ever experienced — 10am, but I appreciated being able to sleep in. Also, that 10am start time is surely to be trumped next week for the Rock ‘n’ Roll Las Vegas Half with a start time of 4pm! Wowza. I was very surprised that the turnout was so huge. 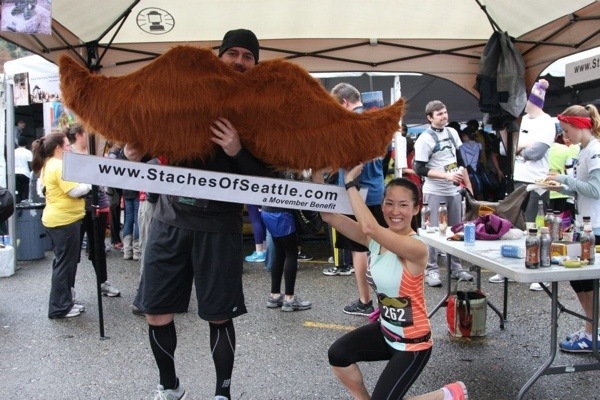 The people behind the Mustache Dache did the right things to promote this run. Plus, who doesn’t love sporting mustaches on their faces and on their apparel? I surely loved it. 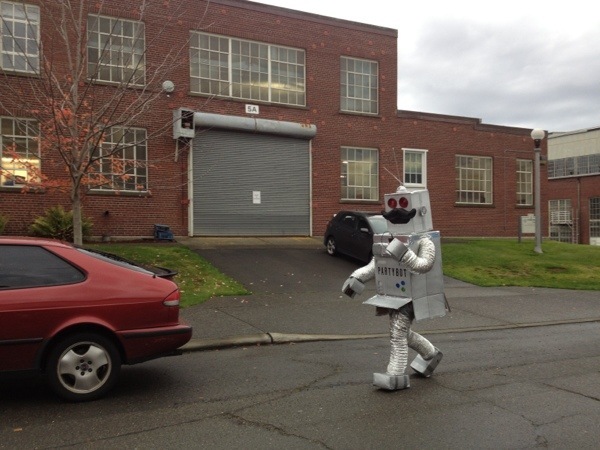 They even had a Party Bot cheer us on. Among the awesome group of blogger girls that I mentioned earlier, two of my Oiselle teammates were running too! Here’s Andrea and I sporting our sweet staches. And here we are with Cathleen who ended up placing 2nd among all women! Super crazy speedy. Once it was time to get the party started, Joe and I found ourselves in the very back of the pack. This was my second-ever 5K race and fun run and I totally didn’t realize how packed in we would be. Joe and I decided that I would go ahead and treat this as a “fun run” but still try and go out to run. We split up as soon as we crossed the start line. The first mile or so was me spending quite a bit of energy dodging people left and right. It was definitely a fun run for many, but many chose to walk it or stopped within the first 0.5 miles to walk. That is totally fine, but I wish that people would know as a courtesy to keep to the right if walking to let runners pass. Also, my own bad for starting near the back. Once we got to the 0.5 to one mile mark, it was getting even more congested as we hit a portion of a trail that was literally limited to two people side by side. This was when I decided to go balls to the wall and start running against bushes, running off the path, anything to get around. It worked. The first mile I finished at an 8:08 min/mile. Once I had passed the first mile, I felt comfortable speeding up as there were less people walking by that time. I was pushing hard but not uncomfortably. Sadly, by this time, my stache had fallen off from the sweat. RIP, stache. My pace for the second mile was a negative split at 7:45 min/mile. Mile 3 went even faster as it was just me running with myself. I told myself that it was almost done and that I should go for it. I accomplished a negative split again with a 7:34 min/mile. Woohoo! With only 0.1 mile left to go and the finish line in sight, I picked it up and finished the nubbin at a 6:31 min/mile. Official time: 23:56 (7:43 min/mile pace) and 36th female. Wowza. My only other 5K run in 2007 was the St. Patty’s Day Dash and I ran that 10 minutes slower. PR CITY!! Especially going into this run with the fun run mentality, I was super surprised and pleased with my finish time. At the finish line, I cheered Joe on who finished shortly after. Poor stache, just didn’t make it through the race. 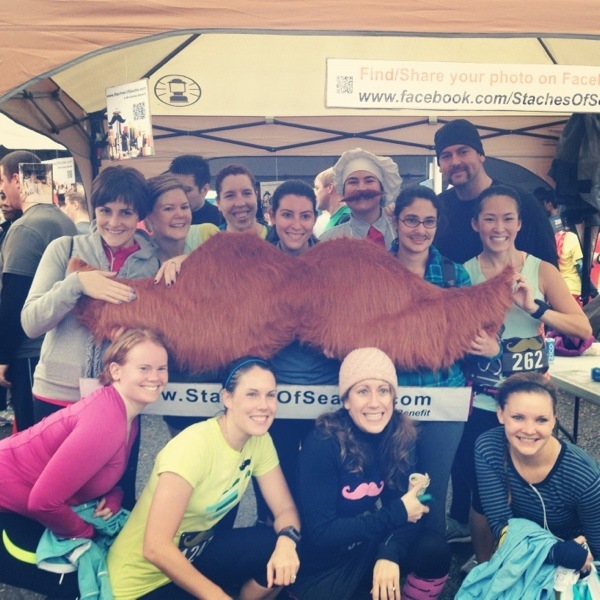 Before we left the race, the girls, Joe, and I just had to get a group shot with the big, hairy 5-ft stache. Sweet! I also wanted to show off my strength as Joe grew another 5-ft of hair on his face. 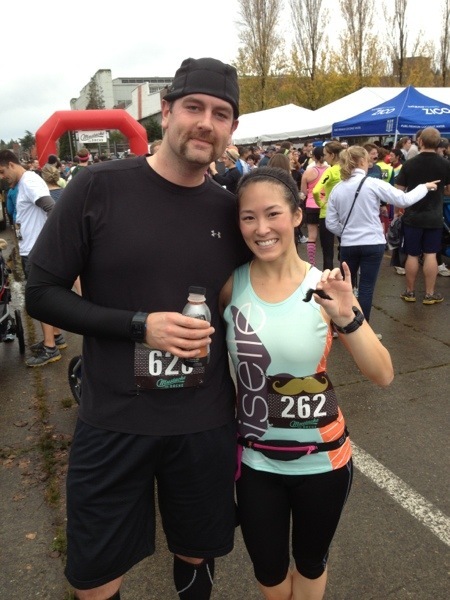 Overall, this race was super fun and the organizers did a great job at getting the masses out. 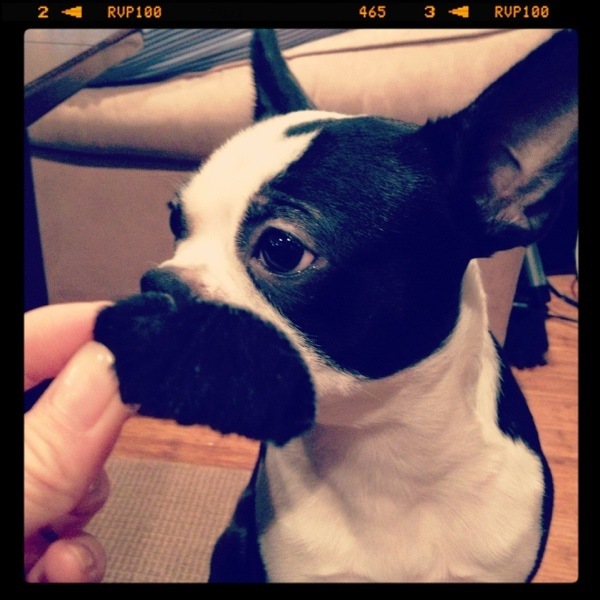 Go Movember and mustaches! I also appreciated that they had photos uploaded on a site available for free download. I actually found a couple of pictures of me that turned out quite decent! 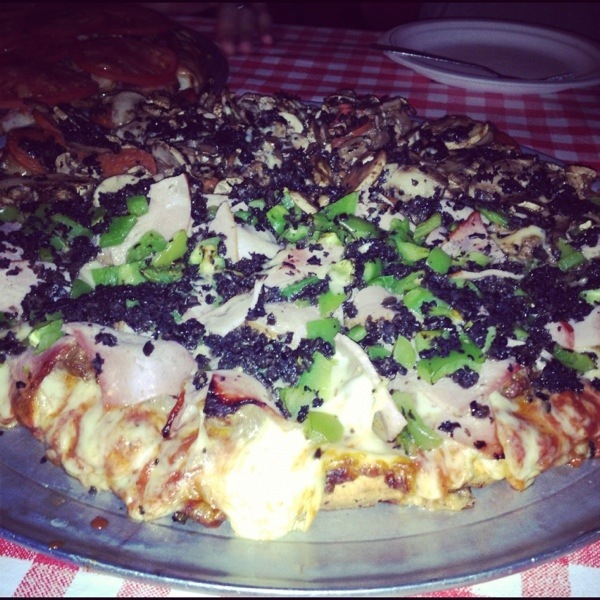 Later that evening, Joe and I met up with some friends at Northlake Pizza Tavern for Joe’s favorite pizza place ever. This establishment has been around since the 50s and is definitely a place that I’d imagine being on Diners, Drive-Ins, and Dives. Really good pizza that weighs likely 15-lbs. Yum! After pizza, we went to the new James Bond movie, Skyfall. I’m not the biggest fan of Bond movies, but I thought that the movie turned out great. In my opinion, Daniel Craig solidified himself as James Bond. The next morning on Sunday, Joe and I had dim sum at my favorite dim sum place in Seattle, New Hong Kong Restaurant in the Intenational District. Sooo delicious. Great weekend filled with running, good food, and friends. So thankful! 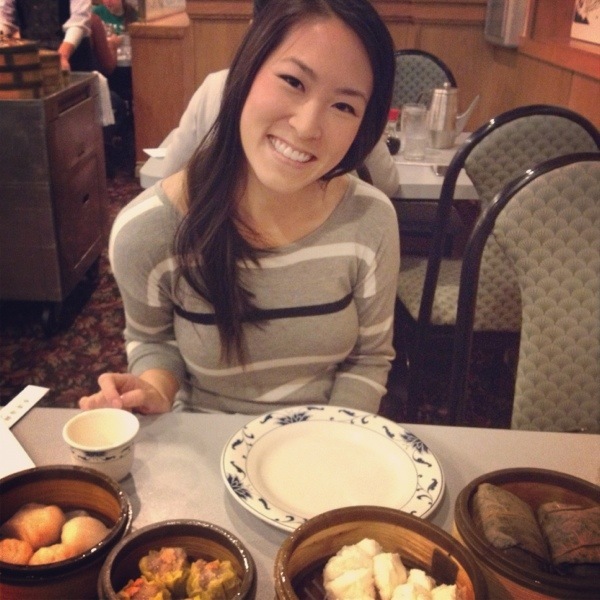 Glad you had a great time and good to meet you, Sarah! Good to meet you too! Thanks for putting on such a fun race! Haha thanks, Becky! I think over the years I’ve become so accustomed to him growing a mustache once a year. Now, if he wanted to have a mustache year-round… not quite sure that would fly.